Bluebird or blower, in-bounds or out, the Black Diamond Mission Shell is their go-to, do-it-all ski jacket for hundred-day seasons and bell-to-bell days. Featuring Gore-Tex® shell fabric for uncompromising waterproof and breathable protection, the Mission has a soft interior backer for added comfort and extensive pocket storage for small essentials. The integrated Cohaesive™ cord-management hardware in the hood provides an equalized, three-way adjustment with a single pull on low-vis storm days. Extended, two-way zippered armpit vents let you dump excess heat quickly on the skin track. An integrated powder skirt acts as a second line of defense on those all-time deep days. Mission Shell - Mens is rated 5.0 out of 5 by 1. Rated 5 out of 5 by YETZ from Bomber freeski shell This was my first Gore shell and it works like magic! 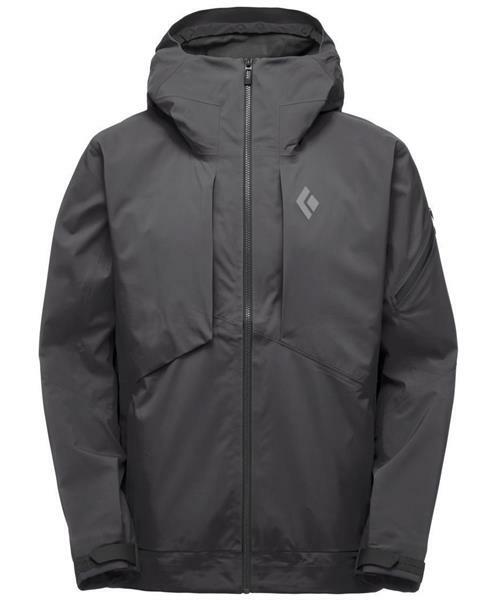 From rainy summer hikes to Cold days ski touring or lapping the ski hill you will be comfortable and dry. Designed as a freeski shell the 70D face fabric is super durable for booting through the trees or sliding along corduroy on your back in the terrain park. This shell fits long and has good ease over body but its not too baggy. It is not the most pack-able piece but that's the price you pay for durability.